The earliest locking mechanisms date back 3,000 years and, surprisingly, vaults have been around for 2,000 of those years. 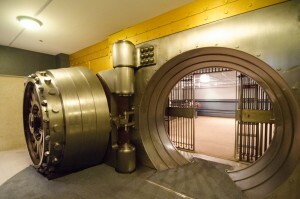 However, it wasn’t until the ability to mold and use metal that safes and vaults became really secure and especially over the past 200 years that advances in metallurgy have produced the most secure vaults and safes. Banks have a long history of having very secure vaults as do armored truck companies like Brinks, Loomis, Garda, Dunbar, and many others. These companies collect checks and cash from bank corporate and retail customers and process those deposits to the bank. Although cash logistics has long been within the purview of these companies, check processing has only more recently been offered as a result of remote check truncation introduced with the Check Clearing for the 21st Century Act of 2004. Given the relatively new status of vault operations offering check processing, many vault operations needed to integrate this process with the cash logistics that they have traditionally offered. Yet, check processing is very different from cash processing as it requires the capture of the check image and MICR data. The challenges involved include the creation of an X9.37 file formatted according to the standards of the particular bank and the ability to transmit all of that information to each bank again according to that bank’s standards. Each vault operator works with multiple banks and each bank works with multiple corporate and retail customers, depositing a variety of checks, money orders, coupons, and other documents from various states across the country. There are a lot of logistics to deal with and to account for to make the process user-friendly for the operator. Overall, vault processing is good for both businesses and banks as it improves cash flow for the business and allows banks to meet minimum cash reserve requirements while expanding loans to other businesses. Like Remote Deposit Capture, vault processing reduces “desk float”, the time between receiving cash and checks to the time it hits the customer’s bank account. Check out Vault by Digital Check® for more information about how our scanners and software are helping banks and armored truck companies optimize their vault operations.